There are quite a few ex-pats with pets in Luanda – and although there are difficulties, they can be overcome. We’ve added our thoughts below on the amount of space available for dogs, on vets and also on pet food. Sadly, Luanda is not a very friendly city for dogs. There are no dog parks or restaurants that permit dogs, and walking on the streets here is difficult and can be unsafe. As a result, it is important to choose a home to suit your dog, e.g. if you have a big dog you need to try to live on a large compound so you will have space to exercise them. If you live in the city it is possible to walk your dog on the Marginal and the Ilha, but again you would need to take safety into consideration before doing this. During the week, I have heard of people taking dogs over to Mussulo Island. You would need to go in a group, and find a boat man who is not afraid of dogs. In all areas, stray dogs can be a problem. Veterinary care here can be limited, but has improved greatly over the past few years. Casa dos Animais in Talatona has several English speaking vets, who are hardworking, but only available during working hours Monday to Saturday. At the moment they offer no after-hours emergency service. It is located near the new KFC on the corner of Av 21 de Janeiro and Estr. da Samba. A new veterinary practice has just opened in Gamek, and it seems they will offer a 24 hour service. 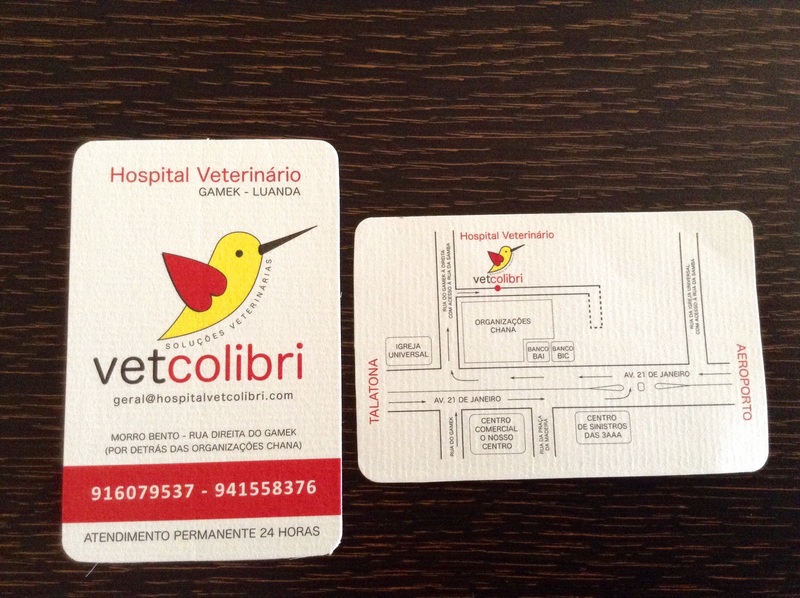 It is called Vet Colibri and the contact numbers are 933117867 / 916 079 537/ 941 558 376. Pet food is becoming more widely available, but as with human food, if you find what you need, buy plenty of it! Many pet shops now stock Eukanuba, and Kero often get deliveries of Pedigree. Cat food can be a little more difficult to find, and cat litter near impossible, (although it has been seen at Vetcolibri). There are many pet shops on Rua Kikagil, which runs between Maxi Morro Bento and Academia BAI. In town, there is usually a good supply at Pet Shop Bairro Azul. It is located on the corner of R dos Herois as you turn to go onto Agustino Neto. We would love to hear what you do to entertain your furry friend here, and if you have found a good spot to exercise them/ a good pet shop/ groomer etc, to help us build up our directory! Please leave us a comment below if you have any suggestions! Lynette, yes, you can find it at “MECOVET” in Largo do Soweto in Villa Alice or in Viana at their shop in “Viana Park”. GOOD EVENING. WE ARE GOING TO LIVE IN TALATONA. WHERE CAN WE FIND FOOD DOG FOR ANIMALS WITH KIDNEY PROBLEMS? We have 2 pet stores here in Talatona area, they sell Equilíbrio Veterinary Dog food, for specific ailments, go to their website ( Equilibrio) and see if they offer specific for kidneys. We are travelling from Namibia to Angola by road and need a import permit for our dog. Does anyone have contact details for the state vet? I need help. My mother want to buy a pug, do you know where I can find here in Luanda? Hi, i am an international vet with over 30 years experience in US, CANADA AND SEVERAL AFRICAN COUNTRIES, looking to work in Angola.